Kraken Robotics Inc. subsidiary Kraken Robotic Systems Inc. has completed military standard certification testing of the KATFISH-M, a ruggedized version of Kraken’s KATFISH Towed Synthetic Aperture Sonar Platform. 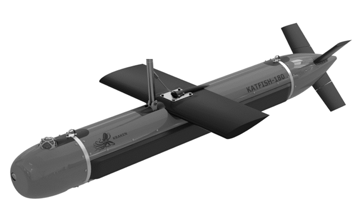 KATFISH-M incorporates a Synthetic Aperture Sonar (SAS) in a compact, lightweight and hydro-dynamically stable towed body. It uses advanced signal processing and algorithms to provide real-time, detection and classification against underwater mine threats. KATFISH-M was tested and certified by independent laboratories on a variety of U.S. Department of Defense military ruggedization standards known as MIL-STD-810G and MIL-STD-461. The MIL-STD-810G focuses on environmental engineering and requires products to pass a series of laboratory tests to ensure that military equipment can operate in extreme worldwide environments. The MIL-STD-461 standard covers the requirements and test limits for the measurement and determination of the electromagnetic interference characteristics (emission and susceptibility) of electronic, electrical, and electromechanical equipment. With these certifications in place, KATFISH-M is now an off-the-shelf solution proven suitable for global deployment in military and defense applications. The commercial version of KATFISH is priced at $1.5 million, while the military certified version, KATFISH-M, is priced at $2.5 million. Both systems are available now.